After the gales of the Fair Isle Channel, the passage down the west coast of the Hebrides was marked by calms. I can tell you two things about St Kilda. All the people left 1930, unable to cope any longer with the hard life on this desolate piece of granite 60 miles out in the Atlantic. Secondly, part of the reason was because the island’s gene pool wasn’t what it was: For hundreds of years there had been a tradition that if a young man could climb to the top of the gigantic sea stack which rises hundreds of feet out of the ocean next to the largest island, stand on the stone at the top, join his hands in front of him and then jump through the hoop made by his arms without falling off and plunging to certain death, then for one night he could have the pick of all the women on the island. It was great for the young men. Who knows, some of the young women might have been quite keen too: A man who could do all that must have seemed like Justin Bieber and Brad Pitt all rolled into one. 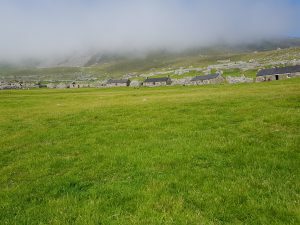 In fact, if it hadn’t been for the arrival of the Rev John MacKay in 1865, this resilient micro-community might still be there, subsisting on sheep and seabirds and defying the outside world. But even before the new minister got around to banning the singing of anything but psalms, dancing, games and storytelling, he put a stop to the heathen practices on “The Mistress Stone”. 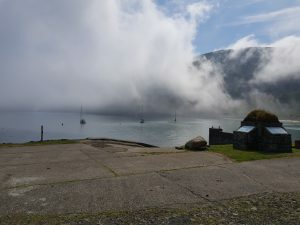 The idea of spending a couple of days anchored in the bay, sharing the warden’s solitude was too much to resist – and exactly two weeks after leaving Suffolk, the anchor went down in Village Bay. In I could see it, six metres down in water clear as air. More chain rattled over the gypsy, full astern with the engine to dig it in and then switch off. You know that annoying sound which large earth-moving vehicles make when they reverse – that they make incessantly because they’re always reversing? Well that is the sound of St Kilda today. It just so happens that, now the World Heritage people have seized on it, the place has to be done up – which means that now it is not only home to the warden and the MoD but also about 25 construction workers living in a row of green Portacabins. There are hoardings with artist’s impressions of how the St Kilda Accommodation and Infrastructure Project will be in keeping with the ambience of this historic location (once they’ve torn down the hideous power station and taken away all the Portacabins). In the meantime, there’s quite a community. John Sikorsky, who calls himself the Ranger, not the warden, has a Seabird Ranger as well – and an archaeologist. Altogether, you have almost as many people as the 37 islanders who were evacuated to the mainland all those years ago. Their names are written on slates in the fireplaces of their old houses – and in the kirk, on the open page of the Bible, there is the list of deaths from the 1870’s – mostly in infancy. For £190 you can take a high-speed trip from Harris – two-and-a-half hours each way which leaves five hours on the island. Actually, that’s plenty. The gift shop doesn’t take long. There was also what appeared to be a converted fishing boat which took eight passengers on a sort of mystery tour – the mystery being that the skipper would decide on the destination only after listening to the forecast. Or you could join a cruise ship. Yes, they call at St Kilda. John the Ranger goes aboard to give a briefing and warn the passengers not to leave the village. Not only are there no fences or warning signs to stop them falling off a cliff but, if the weather turns, that’s 300 people who have to be ferried back to the ship before the swell threatens to capsize tenders at the pier. Arrival at the St Kilda group. Calm again! The new houses built in the mid-1800’s – every modern convenience (chimneys and windows). The weather changes quickly here. 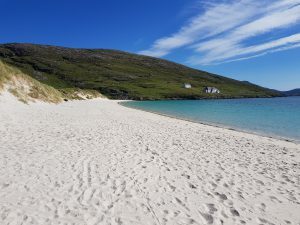 This was a must: The pilot book describes Vatersay Bay as “the finest Sandy Beach on the East side of the Outer Hebrides” and it is fabulous – white sand and crystal clear water that would not be out of place in the Caribbean – and, as you see, not a soul on it. To give myself an excuse to go ashore (not sure why I needed one), I took the gash (rubbish) with me and walked up to a little group of houses. After the beach, they were a bit of a disappointment – somewhat shabby prefabs with a temporary air about them. But then, until 1991 when the causeway to Barra was completed, building materials had to come by boat. Of course, the whole Island has a complicated history when it comes to settlement. 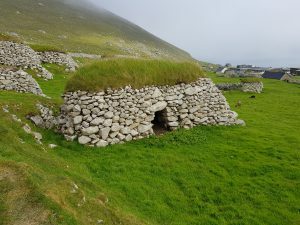 Until 1906 it was left to the birds and seals but then, men from Barra landed and claimed they were exercising their ancient rights to the land. However, the owner of Vatersay, one Lady Gordon Catchart, would have none of it and took them to court. Despite massive public support, “The Vatersay Raiders” were sentenced to two months in prison. But Lady Catchart’s heart seemed to have gone out of the fight and she sold the island to the wonderfully-named Congested Districts Board which allocated crofts rather in the way West London councils allocate allotments. Remember when people used to like to “get away from the telephone”. What ever happened to that? I have just spent three weeks trying to find a mobile signal. Obviously, sailing long distances, there are going to be times when you are out of sight of land and we all know the UK networks don’t even stretch across the English Channel. But last autumn, coming round from Wales and this spring, down to the West Country and back, I was never out of touch for more than a few hours at a time. 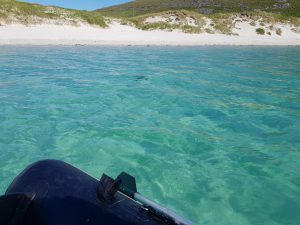 The trip from Suffolk to the Outer Hebrides, however, has been a learning experience. After leaving the Norfolk coast behind on June 17th, it wasn’t until I got to within five miles of South Uist that I was able to call anyone. That was on the 30th – and I still didn’t get any data. The Community Shop and café does indeed have free wi-fi – it’s just that, whenever I looked, about a dozen people were crowding the three small tables, sitting over cold coffee and poking at iPads. Instead I went to the Castlebay Hotel and sat in the lounge (no-one else did). At £4.50 for an obligatory pint of McEwans, it made for some expensive emails. Cheaper to send a letter, of course. I know because I thought it more appropriate for my 22-year-old son who is about to leave to teach English in China for a year – the post office sold me a single envelope and a single stamp. In the end, there was nothing for it but to move to North Bay – and what do I see when I look up? Flannan Islands are uninhabited. I’m not surprised. They’ve got an automatic lighthouse and two landing places with concrete steps but one set was washed away years ago and the other is no longer maintained and might not be there even now – but who’s to say? All the same, I’m beginning to think I live here. These fifteen lumps of granite looked rather beautiful – in a desolate sort of way – as I approached at sunset last night. There is some grass growing and a lot of white from the thousands of seabirds which clearly think this is the perfect place to call home. 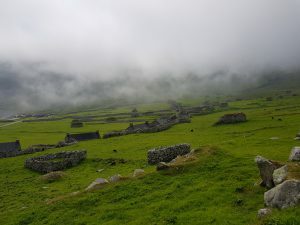 Nevertheless, I passed in the night a few miles off on the way to St Kilda which is also uninhabited but hasn’t always been (where lies a story). The problem with passing the Flannan Islands at night is that, steering by the wind, what would happen if the wind were change while I was asleep? I could be on the rocks. All the same, it doesn’t make for a peaceful night. More than once, I woke before the alarm. Lying there, listening to the water going past the hull, there was a tendency to wonder what should have caused this sudden wakefulness – after all, it appeared that I was not just awake. I was fully alert. Something was up. Was this Chiefy keeping watch? Of course, it could be the islands themselves. There’s something odd about the Flannan Isles: Every Scot knows the story… how the three lighthouse keepers mysteriously disappeared a few days before Christmas in 1900. One way and another, it would be foolish to go back to sleep with that sort of thing going on. So, unzip the sleeping bag (God, it’s cold). It’s also dark (wait a minute, I’m wearing the indoor wooly hat which rolls down over the top half of my face the blocks out the light. I’m blundering around in a blindfold). First check is the plotter which shows the boat still on course, the islands well astern – a group of fishing boats ten miles away – have to watch them; unpredictable things, fishing boats and once they’ve got their gear down, they have right of way over everything else, rather like cyclists in Holland. Pull the hatch back and stick my head out. Now it’s really cold. Boat seems OK, Flannan Islands still there at a safe distance. Doesn’t it ever get dark in these latitudes? And this happened two or three times – quite apart from the alarms going off every hour, so what with one thing another, it wasn’t a particularly good night. I shall be glad to find some peace in St Kilda. We made three miles towards our destination last night. It wasn’t as bad as it sounds. In the same eleven hours, we sailed six miles through the water. It’s just that we weren’t going in the right direction. Yes, you guessed it, on the hottest day of the year in England, there was still drizzle in the North of Scotland – drizzle and incessant headwinds. I’ve worked it out: We have had headwinds now for seven days in a row – first of all North Westerlies on the way up the East Coast towards the Orkneys. Then Westerlies across the top (strong to “near gale” Westerlies to make sure the sea stayed good and rough after the full gale that saw Samsara scuttling into Fair Isle). 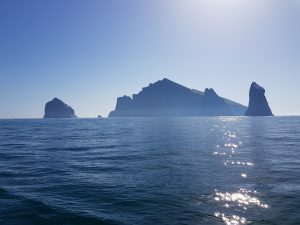 And finally, just as I get to the top of the Hebrides, ready for “left hand down a bit” to St Kilda, what do I get: First of all, a flat calm to announce the coming change in the weather – and then, can you believe it? A light South Westerly. Some things are just not fair. There’s only a hundred miles to go after something 850 during which there hasn’t been a single complaint (well I don’t remember it) and now this. I was all ready to enjoy today: I had taken advantage of last night’s calm to wash and change my clothes for the first time since Fair Isle. I even got undressed and climbed into a sleeping bag – it was Heaven. Well, that was a couple of hours ago. Now I can tell you that I wouldn’t swap places with anyone on Brighton beach. The charcoal stove is fired up – once I got the seawater out of it (how did it get there?) I just checked the thermometer again: 23.5o! Mind you, I didn’t notice this for a while. I had made the mistake of sitting on the leeward (downhill) berth to write this – it seemed that on the leeward berth, the laptop was less likely to slide off my lap. But you have to remember that hot air rises – which means that all the cold air burrows its way underneath – right onto the leeward berth. I am now sitting to weather, as us old salts would call it, and I’ve had to move along the berth away from the stove. I may never come back to Fair Isle. After all, how many people visit Fair Isle in the first place: A tiny lump of rock midway between the Orkney Islands and the Shetlands off the North coast of Scotland, it is barely more than a mile long and famous for two thing: Fair Isle sweaters and seabirds. And if I showed any sense of occasion, I should go ashore and look at it. But then I’m not supposed to be here at all. I had safely passed it to the south – and very forbidding it looked in the oily yellow light of a stormy dawn. I had chanced to hit the Fair Isle Channel at the exact moment the tide turned against me – and much stronger than I expected, it proved to be. So instead of “popping out into the Atlantic” as according to the plan, the track on the plotter seemed to be going backwards and forwards over the same stretch of sea. And the Shipping Forecast’s “occasionally gale 8” seemed to have become a fixture. By breakfast time, I had the storm trysail set and was calculating that I could always heave-to and slide backwards the way I had come. There are times when common sense takes over. Fair Isle was just five miles away with a narrow rocky inlet called North Haven which offered good protection from North Westerlies. I could be there in a little over an hour. It took longer, of course. These things always do but now Samsara lies at anchor in an impossibly small space between the pier, the rocks, the slipway and an awkwardly-placed lobster pot just opposite a huge ocean-going fishing boat hauled up in what appears to be a man-made gully hewn out the rock. I’m beginning to realise what kind of weather ranks as normal up here. So now the charcoal stove is fired up, the wet clothes which festooned the cabin have gradually dried and been put away, there appears to be no mobile phone signal and only Radio One. I could have blown up the dinghy and gone ashore to explore but quite honestly, I don’t want to. At times like this, your world can get very small. I had a comfort lunch of beans and eggs. The other half of last night’s mixed bean stew only needed warming up for dinner (seems like a lot of beans). Thank heavens I picked up a cheap lighter in a convenience store last summer “just in case” – the gas lighter has packed up and all the matches are damp. Meanwhile the awkwardly-placed lobster pot marker turns out to be a seal which remains motionless for minutes on end just staring at me. Eventually he dives, swims under the boat and looks at me from the other side. Meanwhile the BBC forecaster seems to know nothing about the mysterious Scottish “outlook” so maybe sI shall be off again tomorrow – with dry clothes, a good sleep … and full of beans. Day Eleven and I’ve settled into the voyage. I know this because this is the fourth day of strong headwinds and, I just got the clarinet out for half an hour and now I’m sitting here writing this. In effect, life goes on. Until now, I would spend hours at the chart table fretting about whether to tack of worrying about not getting a Navtex weather forecast. But then, as if on cue, today has been a very good day. It began when I looked out on my hourly inspection and found the trailing generator had come partly adrift. It could wait. I could go back to sleep. Do it later… do it after breakfast. And that’s what I would have done – yesterday, when it mattered to me that it was 4.30 a.m. and any sensible person should have been asleep. But now suddenly I found myself saying: “Do it now.” I looking at Chiefy. He regarded my coldly from his perch behind the chart table. Apparently I needed a stuffed bear wearing a Guernsey and a red neckerchief to help me to remember that “if a job’s worth doing”, it’s also worth doing now. But now I looked closely, wasn’t that bolt loose? In fact, wasn’t that bolt about to fall out any moment? Surprise, surprise: It doesn’t clonk any more. It would be easy to complain about this. Indeed, I have a suspicion that I have been complaining to myself for the past three days – more, if you count the calms coming up the North Sea. But no, that’s just what we happen to have got at the moment. This is me being philosophical. I could have told them that. If I poke my head out of the hatch, my hat does not get blown off. Not to put too fine a point on it, there is no wind at all. None. We are going nowhere. I woke from my afternoon nap (to differentiate it from my morning nap, my evening nap and my various night-time naps) to the sound of sails slatting from side to side, the boom banging and the self-steering clonking. This is when the Old Man must stop thinking about progress. After all this is not a race. I have no-one to measure myself against. So, a distraction is what is needed. There are two distractions on this boat. One is Mr Kipling’s Cherry Bakewell Tarts and the other is Mr Kipling’s French Fancies. If you’re not familiar with British supermarket shelves, Mr Kipling is baker. He has a little corner shop just off the High Street where he produces the most wondrous cakes and pastries – a sort of Willie Wonka of the bakery world. As often as not, he will pop an extra macaroon into your paper bag with a conspiratorial wink as if to say: “Don’t tell Mrs Kipling”. At least that is the image behind the brand dreamed up by the advertising agency employed many years ago by the vast conglomerate (Kraft? Unilever?) which owns the Mr Kipling brand. Anyway, I was in Sainsbury’s doing the last-minute victualling (serious stuff like corned beef and porridge oats) when I couldn’t help noticing that Mr Kipling’s Cherry Bakewell Tarts and his French Fancies were on Special Offer – and we do love a special offer. So far, so good. The colourful boxes were stowed away with everything else – at least, the Cherry Bakewell Tarts were – what happened to the French Fancies, I have not the faintest idea. There was a moment when I sat back on my haunches in the middle of the not-very-large cabin, surrounded by packets and tins and jars and came to my senses. The logic went like this: The French Fancies were here. It was just that I couldn’t see them – like looking for the butter in the fridge (I’m looking for butter in a gold wrapper. How am I supposed to see butter in a plain wrapper). So here was the deal: I would make a cup of tea and have one of Mr Kipling’s Cherry Bakewell tarts. Only after that would I put everything away – and if, in the course of restoring order, I happened to chance on the French Fancies, well… I could reward myself with one of those as well – and another cup of tea. And do you think I found them? Of course I found them. Right next to the Cherry Bakewell Tarts – only they were in a slightly smaller colourful box (Fancies are smaller than Tarts – it makes sense). I was looking for a box the same size. I had hardly finished the last mouthful, carefully collecting the crumbs by squashing them with my finger (I must be watchful for deteriorating personal habits) when I realised that the whole world had leaned over a bit and there was a delightful chuckling sound as the water started moving past the hull. We were on our way once again.